laurel etagere. roman etagere. pompeian etagere. custom furniture. The design of the Laurel Etagere was influenced by the mythology of ancient Greece. In the Greco-Roman world, laurel wreaths were used as an adornment that could represent a person’s occupation, rank, achievements, and status. The use of this wreath comes from the Greek myth involving Apollo, Zeus’ son and the god of life and light, who fell in love with the nymph Daphne. When he pursued her she fled and asked the river god Peneus to help her. Peneus turned her into a laurel tree. From that day, Apollo wore a wreath of laurel on his head. Laurel leaves surrounded the temple of Apollo to cleanse the soul before entering. Associated with purification, it was seen as a plant with powers of immortality. The common belief was that laurel awakened awareness and past life memories, stimulated psychic awareness, improved health, and gave the power of divination. Laurel leaves were often placed under pillows at night to gain inspiration through dreams, and its intoxicating properties were associated with prophetic and poetic inspiration. Shah Gilani, ASFD, was inspired to design the Laurel Etagere after bringing home a laurel leaf from Tivoli. 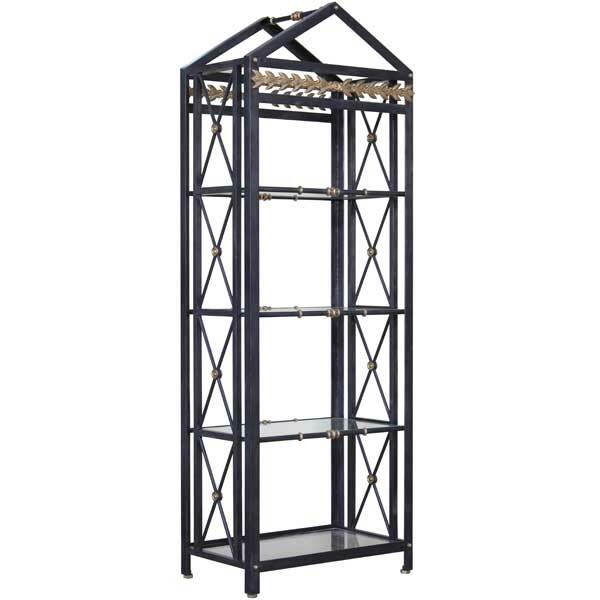 Robust metal construction of the this etagere allows its frame to support thick glass shelves without shaking. It makes an exceptional display rack for objets d’art, or it may be used as a bookcase. Four polished bronze glides are provided which also serve as levelers – a useful feature when the floor is uneven. It is offered in a variety of finishes and accents. Custom sizing is available.